Q. How did you come to write Dog on It? A. My wife said, How about doing something with dogs? The basic building blocks came to me right there at the kitchen table: two detective pals; narration by the four-legged one; and all in the first person, which I’d never tried before in a novel. Plus the most important thing – Chet would not be a talking dog (or be undoggy in any way) but would be a narrating dog. Anything that thinks and has memory must have a narrative going on inside. I went to the office – over the garage, commuting distance fifteen feet – and wrote the first page. Then I wanted to know what happened next. Chet is a mixed breed law academy dropout. Bernie is a retired police officer trying to be a private detective. Between Bernie’s divorce, Charlie his sone and Susie Sanchez, Bernie’s reporter girlfriend, Chet can’t catch a nap and is always on the alert. Chet has a dry sense of humor, which the reader, Jim Frangoine, does well. These are wonderful books for those who enjoy the narrator being the four legged kind. 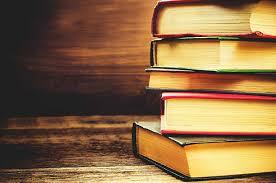 There are three books in teh series so far: Dog on It, Thereby Hangs a Tail and the newest book, To Fetch a Thief. Deceptively slim and compact, this short novel really packs a punch. Told from the viewpoint of a house cat, emotions run from poignant to laugh-out-loud funny to bittersweet and sad. Through it all, this little cat delivers some great truths about humans and life with an uncanny eye for the truth. Foudini, the title character in The Autobiography of Foudini M. Cat, starts life as a feral stray, born in a wall. When his mother fails to return one day, his cries alert a passing human who rescues him. Adopted by a young couple, he learns to trust the woman (who he calls “Warm”) and tolerate the man (“Pest”) He also becomes fast friends with the resident dog, Sam. Now the young and foolish kitten Grace has been added to the family and Foudini attempts to fill her in on the important issues of life. 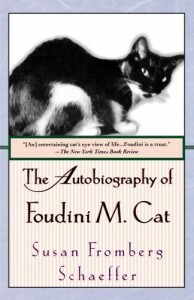 Through Foudini’s wise observations, we see the world from a cat’s perspective – fulfilling the basic needs of shelter and food to the more abstract necessities of attachment, friendship and love. This is one of the funniest books I’ve ever read – Foudini’s disgust at Warm trying to “talk cat” or Grace’s complete disregard of his lessons are hilarious – yet Foudini remains thoroughly cat-like in his thoughts and reactions. Foudini also faces tragedy and loss and must learn to cope and move on – keep the tissues handy for this section. Beautifully written, this lovely story will stay with you long after you put the book away. If you’re very lucky, you might run across the audio version of this book. However, it’s only available on cassette, is out-of-print and difficult to find. If you do find it, grab it. It’s narrated by David Hyde Pierce (most famous for playing Niles on the tv show “Frasier”) and is a gem of fine storytelling.